My recent visit to the pompous cold and gloom of Felbrigg Hall in Norfolk was relieved only by (a) a chat with an elderly gentleman guide who recalled being introduced by Richard Burton to Francis Bacon at the Colony Room during a student drinking binge, and (b) the acquisition for a song at the National Trust second hand bookshop of Michael Holroyd’s 1975 biography of Augustus John. It’s become the norm to compare the boho-machismo of Augustus unfavourably with the demure painterliness of his long eclipsed sister Gwen. And certainly his work is problematic, veering uncomfortably between genius and the risible. 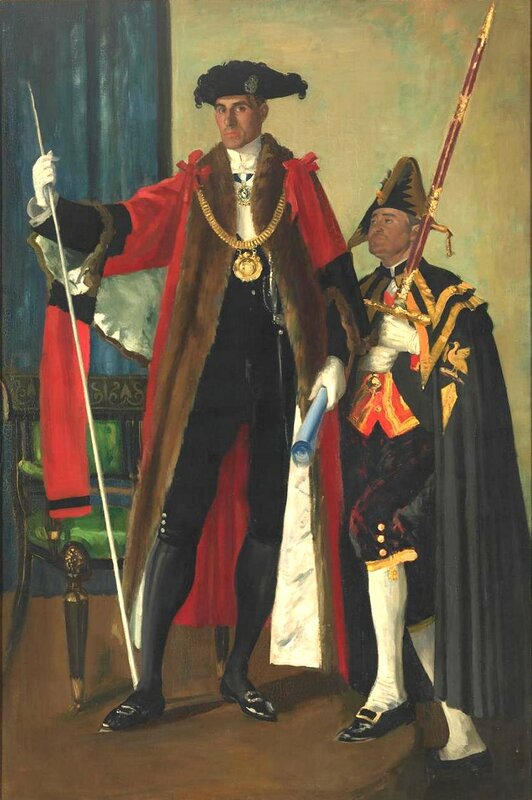 Many of the commissioned portraits come in, rightly, for their share of stick, but one of the earliest, to my mind, is a clear piece of evidence (among many others) for John’s greatness: it is his 1909 civic monster, Portrait of His Honour H C Dowdall KC as Lord Mayor of Liverpool. Though in his biography Holroyd too often employs literary twiddles to disguise a lack of hard fact, he does a good job of chronicling the troubled history of this painting. As completion became increasingly problematic John found himself anxious to escape the claustrophobic ambience of officialdom: “I had but one desire: to submerge myself in crude unceremonious life.” But his nocturnal excursions to this end were deterred by Dowdall, who had been advised by the police that such outings might “prejudice in some way the dignity of his Office.” After a spell of recuperation among Welsh gypsies, John returned abruptly to finish the portrait in a single day. The result, a masterpiece of satirical painting, caused predictable outrage when unveiled at the Walker Art Gallery, the critic of the Liverpool Daily Post suggesting that footman Smith had grounds for legal action. The Liverpool Courier found it to be a “topical allegory” with “symbolic value,” the figure of Smith personifying the abasement of the Labour movement before the Liberal government. A false rumour arose that Dowdall had hired a gang of burglars to get rid of it, only to find that they had ineptly stolen the frame and left the painting. The Walker was packed with locals keen to gawp at “the Smith portrait”. In fact, Dowdall consistently defended the work, though he barely had house room for the seven foot canvas. In 1918 he sold it to a private collector, E P Warren (no relation of mine, as far as I know), for £1,450 and bought a house and three acres of land in Oxfordshire with the proceeds. In 1938 Warren sold it to the National Gallery of Victoria in Melbourne, where it remains, one of twenty Johns owned there. The new price was £2,400. John Rothenstein’s 1945 study Augustus John has the painting as a black and white plate only. The Victoria’s own online colour image is oddly dark and flat, so I’ve tweaked it a bit to copy here. You have to admire the rhythms of the numerous diagonals, the lower right to upper left movement of Smith’s white stockinged legs signalling the parallel line of sight between his upturned eyes and the Lord Mayor, the object of his apparent veneration. Without Smith, the portrait would have been competently dull, and John’s gratuitously vast canvas would have been space needing to be filled; with him, the image is taut and dynamic. It remains, as the Liverpool Courier sensed, a devastating image of the oppressive class system that the painter loathed. And that – a dear old anarchist – was about it for Augustus too, bless him.